Scripture is replete with metaphors, symbolism and figurative language. However, many insist that we must take Scripture literally. “It says what it means and it means what it says”. But is it that simple? When we read Peter quoting the prophet Joel in Acts 2:19,20 what conclusions do we draw? What assumptions do we make? and glorious day of the Lord. However, it is at this point that we need to be very discerning, not just believing things because they have been repeated with authority ad infinitum. If we do we may be in danger of arriving at false conclusions. Let’s look at the following doing our best to put on our 1st-century glasses. At the beginning of the 2nd chapter of Acts Luke announced, 1“When the day of Pentecost came, they were all together in one place.” Further, we read, 5“Now there were staying in Jerusalem God-fearing Jews from every nation under heaven” and 6“each one heard them speaking in his own language“. Could the phrase “in the last days“ refer to a time period other than the 21st-century? Isn’t it quite clear that Peter is offering an explanation as to why these men heard and saw a tornado-like wind coming from above; tongues of fire sitting on each of them; and the miraculous way uneducated Galileans were able to speak foreign languages that they had never learned? God truly was pouring out his Spirit! Let’s move on to the topic at hand – Apocalyptic Language (mp3). We’re going to analyze Old Testament Scripture to see how this type of cataclysmic language is used and interpreted. One of the very useful rules of interpretation is that Scripture should be interpreted in the light of Scripture. So here’s the $64k question: Has the apocalyptic language in Acts chapter 2 ever been used before? Let’s take a look at a few passages in the Old Testament and see what we find. Who prophesied the following words? What were these events referring to? Would you expect a literal fulfillment of these words? Is there any record of these actual events taking place? in the day of his burning anger. Did the heavens actual dissolve? Did the sky roll up? Did the streams turn into a thick black tar-like substance? Will no one ever set foot on that portion of land again? its smoke will rise forever. Let’s look at a few more. Is this truly referring to a cataclysmic event? If so, is there any record of these things literally happening? and the hills melt away. the earth and trampled on them. Were the above verses referring to the kind of cataclysmic events portrayed in the Left Behind series? In other words, were the prophecies fulfilled as stated (stars falling from the sky etc.) or were these prophetic warning referring to metaphoric hyperbole signifying coming destruction? Let’s look at the background of the above verses. 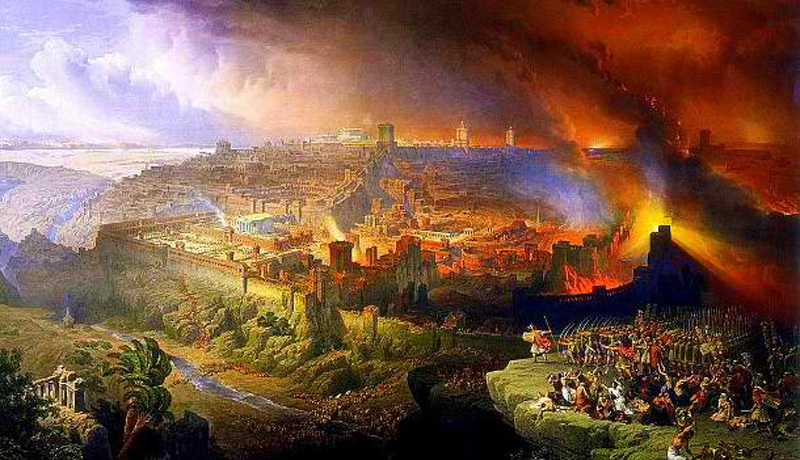 The first group of verses from Isaiah 13 was clearly referring to the fall of Babylon to the Medes in 539 BC. (read verse 1) So, are there historical and/or scientific records which validate the prophesied events as having taken place exactly as stated? In other words, did the heavens actually shake or did the earth move out of its orbit (which would have ended all life on earth)? In Isaiah 34 the prophet, Isaiah announces the desolation of Bozrah the capital of Edom late in the sixth century BC. (read verse 6) If this passage was taken literally/physically, it would be assumed that the sky actually lost its light. Did these events take place as stated or are these symbolic words of the coming annihilation of Bozrah? Then in Micah 1:5 Micah foretells how God will come down to earth in wrath against the sins of Israel. Did the earth split and did the mountains melt, or is this type of decreation language referring to God’s wrath poured out against a group of people? What was Nahum referencing in Nahum 1:5? Did God’s presence cause hills to crumble and mountains to quake so that all the world felt it? Though clearly, God could cause geothermal upheaval at the command of His will, is that what is inferred by these statements of judgment? Lastly, Daniel spoke of stars falling from the sky and then trampled. Literal or figurative? In reality, Daniel was referring to the destruction of the Jewish people by Antioch Epiphanes. or the overthrow of a nation! If the decreation type language we have examined above has the meaning that we have assigned to it, then similar language throughout the Bible should be understood in the same manner. This method of understanding the Scriptures is known as “analogia fide” and is an accepted interpretation principle used by Bible scholars. on the clouds of the sky, with power and great glory. from one end of the heavens to the other. Learning about the uses of apocalyptic language is but one small piece that will ultimately help us put the puzzle together. So it may help to break down artificially constructed walls that are not secured to the foundation of interpretation. Remember to put on your first-century glasses when reading the Scripture, especially when attempting to understand prophesy and the study of last things (eschatology). The Bible was undoubtedly written for our benefit and it is clear that it has a timeless quality in its application. However, we must read it from the audience’s point of reference, understanding of the era in which they lived, while considering the genre of literature used. For example, it’s so tempting and almost second nature to read verse Acts 2:40, “Save yourselves from this corrupt generation.”, to assume that since we have corruption today that this is a direct reference to our generation. However, because a passage may apply to us in our generation (when we see our country in moral decline), does this give us the interpretational freedom to assume that these verses in Acts are specifically directed at us? We need to guard against egocentricity, believing every NT prophetic time-sensitive statement is referring to the 21st century. This same error has been repeated for centuries. We must step beyond the temporal/physical/literal. Jesus said He was the bread of life, but does anyone think His body was composed of wheat flour? When God refers to “the cattle on a thousand hills” we realize that the this is a figure of speech and that God is not expressing His limitation. In John 6:51 Jesus said “…If anyone eats of this bread, he will live forever.” In the very next verse, the Jews began to argue sharply among themselves saying, “How can this man give us his flesh to eat?” So, this woodenly literal interpretation was as common in the first century as it is today. The Scripture is replete with parables, symbolism, metaphors, and apocalyptic language. Therefore, it is imperative to consider the genre of the passage and the type of language used if we have any hope of coming to the correct understanding. Consider the following passage from Matthew’s account of the Olivet Discourse. This passage must be read through the lens of Jesus’ disciples as they were sitting on the Mount of Olives. As you read, if you don’t check your 21st-century presuppositions at the door, this passage cannot be correctly interpreted. If we don’t realize that when Jesus refers to “you” that it is not us, we will forever be lost in a sea of confusion and ultimate misinterpretation. 4 Jesus answered: “Watch out that no one deceives YOU. must happen, but the end is still to come. 7Nation will rise against nation, and kingdom against kingdom. There will be famines and earthquakes in various places. 8 All these are the beginning of birth pains. death, and YOU will be hated by all nations because of Me. 11and many false prophets will appear and deceive many people. 13but he who stands firm to the end will be saved. testimony to all nations, and then the end will come. If these words were written solely to those living in our generation, which many appear to believe, then what a cruel hoax this would have been. When Jesus said, “Then you will be handed over to be persecuted and put to death“, to whom was He speaking? Clearly not us? Some insist that the Olivet is a Ground Hog’s day type prophecy such that it was fulfilled in the first century but yet still remains unfulfilled in a much larger worldwide context. But this kind of “double fulfillment” hermeneutic is nowhere sanctioned by any inspired writer of Scripture. It’s solely wrought in the minds of modern-day interpreters. Consider the following pieces to the prophetic verses which cannot possibly support Ground Hog’s day prophecy. “…but he who stands firm to the end will be saved“. How many ends could Jesus be speaking of? “This gospel of the kingdom shall be preached in the whole world [oikoumene – Roman Empire] as a testimony to all the nations, and then the end will come. So, how many times must the Gospel be preached to the whole world? And again, how many ends are there? “Therefore when YOU see the ‘abomination of desolation, spoken of by Daniel the prophet, standing in the holy place” (Let the reader understand).” Not only did Jesus say “when YOU see” (clearly referring to His followers) but one wonders how many abomination of desolations there are supposed to be? “then let those who are in Judea flee to the mountains…“ How can one flee Judea if they live in Florida? This is clearly 1st-century specific. I have no idea how one can claim that this is a duplicated worldwide 21st-century event. “And pray that your flight may not be in winter or on the Sabbath…“ If this is speaking of 2017 or beyond, what difference would it make if travel was in the winter or on the Sabbath? By contrast, Sabbath and/or winter journeys in first century Palestine were very tough. Again, is it remotely plausible that Jesus was speaking about events taking place in the 1st-century and then again in the 21st-century? “For then there will be great tribulation, such as has not been since the beginning of the world until this time, no, nor ever shall be.” How can there be the greatest tribulation that shall never be equaled, twice? This verse alone destroys the double fulfillment argument. Taking it a step further, in World War 1 and 2 there was far more death, tragedy, and destruction than was endured in either the Neronic Persecution (which devasted the early church) and the war of the Jews (which completely annihilated Israel), but that’s not the point of this verse or this passage. Jesus was targeting the specific set of circumstances that would never be again. “And unless those days were shortened, no flesh would be saved; but for the elect’s sake those days will be shortened.” How can these be doubly fulfilled? How could “those days have been shortened”, twice? Let us be wise in our interpretations and remember that the Scripture was written FOR us but not directly TO us. When we begin to get past faulty presuppositions and free ourselves to come to what may at times be uncomfortable conclusions, then we are on the road to gaining a greater appreciation and understanding of God’s word.